Are you looking for the coolest and the most stylish way to chill out in your living room? Then you need a hanging chair. We can help you find the perfect one for you. Those who want to buy a hanging chair have a wide choice of alternative suppliers and products. There are countless models for different purposes, in different sizes, materials and shapes. The pool of options is so large and you start suffering from “choice overload”? Our purpose is to help you decide what hanging chair is right for your lifestyle and guide you to get the best deal in the market. Find your perfect hanging chair with us! In addition to our own test reports, we also evaluate customer reviews from users who are passionate about sharing their experiences. We check these reviews’ quality and their authenticity and at the end take a final conclusion- do we recommend the purchase or not. Read on to see our top rated hanging chairs! There are various types of hanging chairs, and in each of them the feet lightly touch the ground and like in a rocking chair, one can steer the swinging movement by oneself. Swinging develops the sense of balance and body perception and brings a feeling of well-being. 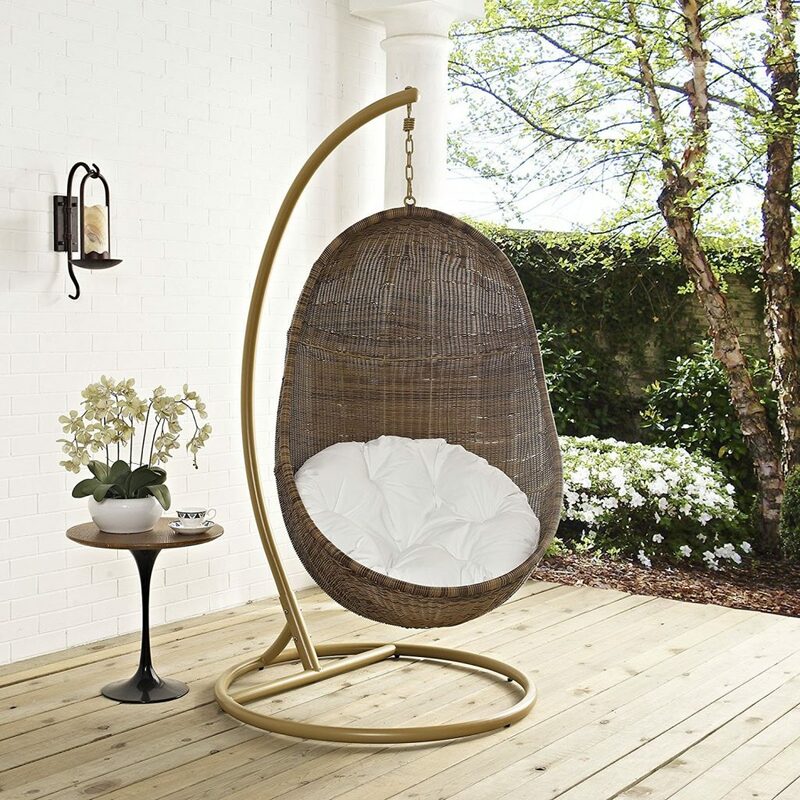 Therefore a hanging chair is often seen as a symbol of leisure, relaxation and simply – easy living. Over the last decade, it has developed into a very popular way of seating and interior design. Indoor and outdoor hanging chairs. Technically, you can always use outdoor furniture indoors, while the opposite is not always the case. Hammock chairs and basket hanging chairs, according to whether they have a hard or a soft seating surface. Hanging chair with stand and ceiling chairs, according to different ways we hang them. 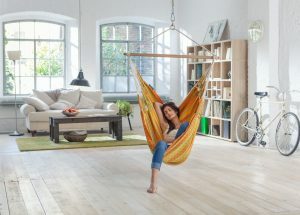 For all hammock lovers, the hanging hammock chair made of cotton or fabric is a great indoor solution. They are breathable, flexible, soft to touch and adaptable to the body. Once you’re in, you don’t want to get out. Since you don’t have to worry about two “ends” being supported, a hammock chair needs much less space but you won’t miss that lazy hammock feeling at all. So it is largely down to personal taste which one of them you choose. The fact is, the weightlessness that comes from being suspended in it is unbeatable on the relaxation scale. 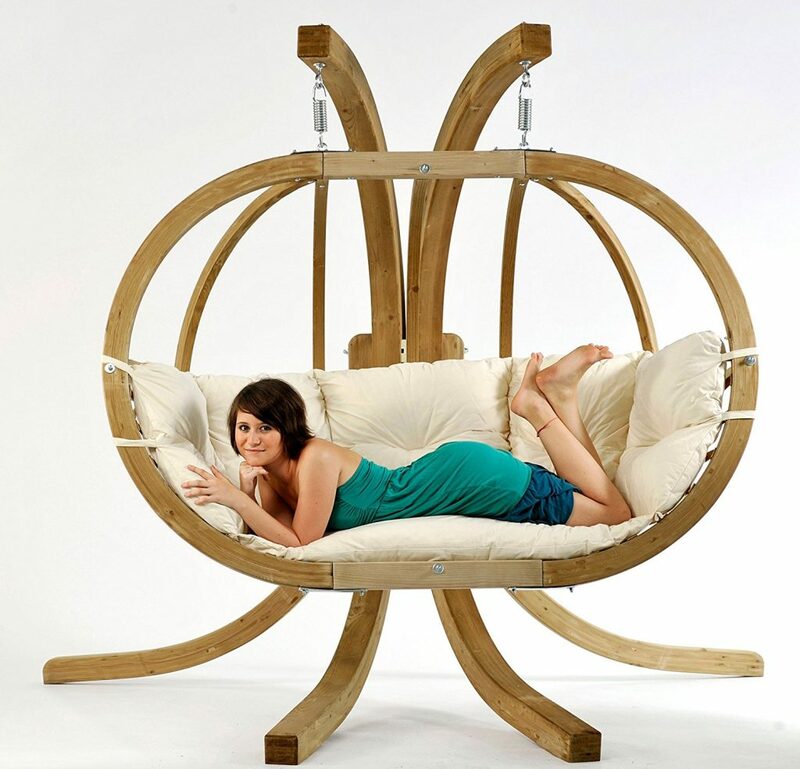 The most popular is the egg shaped hanging chair, but also the old-fashioned Papasan chair is returning with full force. The most common technique used for the construction of a basket hanging chair is wicker. The material choice will have an impact on the aesthetics as well as the strength of the chair. While natural rattan is suitable for indoor use, synthetic rattan, also called all-weather wicker, is specially designed to be resistant to the outdoor elements and can perfectly fit in any home and outdoor design. Check out these awesome hang-time ideas for your home or backyard. This is the pure joy of swinging for the whole family! 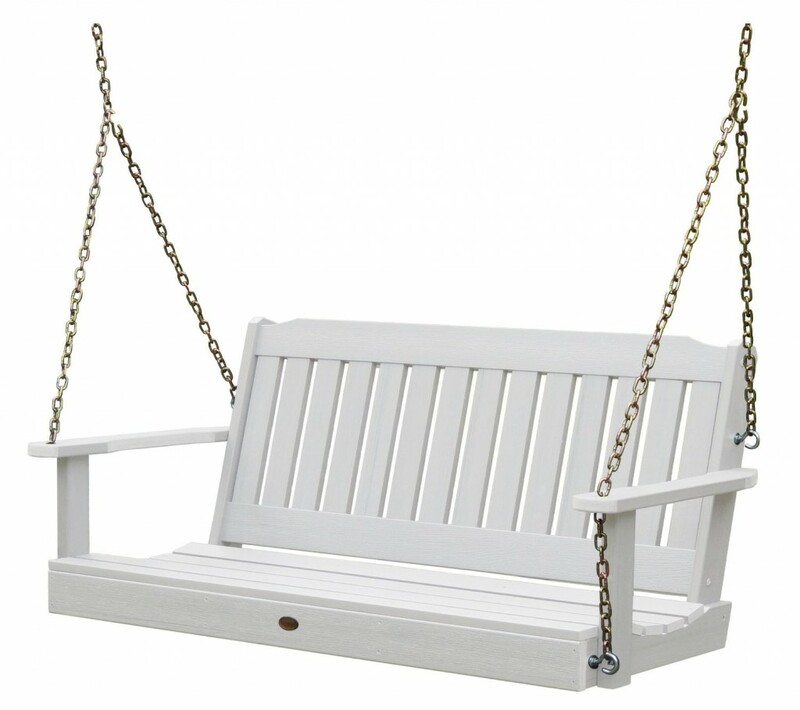 An old-fashioned patio swing is wooden and wide enough to comfortably seat about three adults, with an armrest at each end. Originally they hung from the ceilings of covered porches. Therefore, they are also called porch swings. Today there are more swing options on the market than ever before and you don’t need a porch to enjoy a patio swing. Some people prefer a big outdoor swing where the whole family can sit or even a swinging bed, while others like to have a few single-swings. Swing stands are the perfect solution for people who like to have the freedom to place their swings wherever they like. So don’t get hung up on hanging your patio swing on the porch. Some creative homeowners hang swings indoors too. Hanging chairs are great for kids. They are ergonomic and fun and kids love to have one in their room. It’s like a private area designed just for them. So if you want to make your child happy with a really special gift and use the space smartly, hang a swing chair in a corner, cause it doesn’t take up as much space as a conventional piece of furniture. The gentle swinging in a hanging seat stimulates the sense of balance and can also improve coordination of your child and help to train motor skills. This positively impacts the ability to concentrate and promotes your kids’ learning success. You can hang it from a ceiling. Or if you don’t want to deal with the hanging tools, ropes and bolts, you can choose an “all in one” hanging chair with stand. One way to hang a hanging chair indoors is to attach it to the ceiling. Ceiling chairs need much less room but there is also a space saving stand solution. You can buy a hanging chair with stand as a set, or a single chair and a compatible hanging chair stand separately. Having a stand is the easiest way to move the chair into whichever room you want. What option you choose depends on various factors, such as how many available places you have to choose between. Hanging your chair outdoors is a bit easier if you have a hardwood tree with strong branches in your garden. It can also be suspended from the top of a porch or patio. 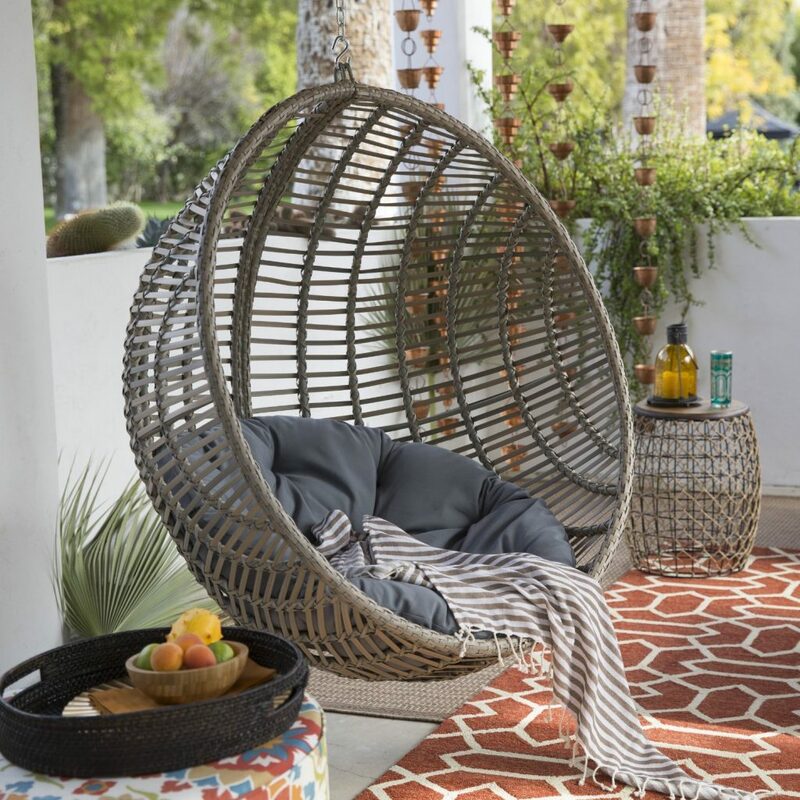 However, if you want a mobile outdoor hanging chair to chase the sun, there are a range of innovative stand designs for every taste and lifestyle. No matter what stage of life you’re in, there’s a perfect hanging chair for your home.